This week’s post was written by Doug Post. We build our own trustworthiness with integrity and dependability. Trust is the cornerstone to building strong relationships with clients and team members. As we delve into the topic of trust, I’d like you to take a minute and think of a person with whom you have a high-trustrelationship. (boss, coworker, spouse, parent, sibling, child, friend.) What words would you use to describe the relationship? What’s it like? (e.g. open, honest) How does it feel? (relaxed, easy) How well do you communicate? How quickly do you get things done? How much do you enjoy this relationship? Now think of a person with whom you have a low-trustrelationship. Again, this person could be anyone at work or outside of work. Describe the relationship. What’s it like? (e.g. uneasy, suspicious, painstaking, excruciating) How does it feel? (not relaxed, on-guard, painful) How is the communication? Does it flow quickly and freely or do you feel like you’re constantly walking on land mines and being misunderstood? Do you work together to get things done quickly or does it take a disproportionate amount of time and energy to finally reach agreement and execution? Do you enjoy the relationship or do you find it tedious, cumbersome, and draining? I think you can see how important trust is to the culture we are building at Interstates. Consider how important extending trust is for onboarding new employees and for “Delivering Results”! In his book The Speed of Trust, Stephen Covey talks about the rewards and the risks associated with extending trust. There are two extremes: people who don’t trust enough – they are always suspicious. And people who trust too much – they are totally gullible. Within these extremes Covey has broken down trust into 4 different types. 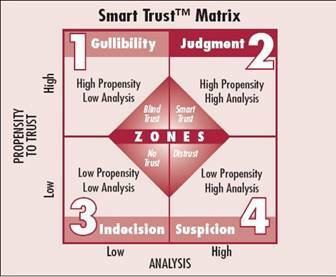 #2 – Judgment – is Smart Trust – this is your target area. You analyze to make a good decision using both good business judgment and good people judgment (including instinct and intuition) to make a decision. The goal is to find middle ground here – or the “sweet spot”. That requires using good judgment. You decide the amount of trust you extend to someone. You learn, over time, if someone is trust-worthy by entrusting them with more and more responsibility. You don’t hand people full trust right off the bat. You also use your judgment to decide what level of trust to offer someone. For example, I trust my wife to take care of our kids or teach a classroom of students; I don’t trust her to lead the startup of a project at one of our customer’s facilities. That honors her character and honestly recognizes her competencies. You have to have the right person, with the right competencies, for the task at hand. For example, when a new employee begins at Interstates, we gradually build trust with one another. We don’t give them our top project or top client without monitoring progress with them. We work together to build trust by extending it to each other. In this case, we follow Ronald Reagan’s advice to: Trust, but verify. To wrap things up, trust will always involve some risk. You have to learn how to extend “Smart Trust” using good judgment. Are you building trustworthiness in your relationships? Do conversations help you distinguish between the character and competence of trust? If not, you are likely being too gullible, indecisive, or suspicious to realize the speed of trust. If you would like to learn more about trust, I encourage you to read The Speed of Trust by Stephen M.R. Covey. For a quick preview on the principles and behaviors of trust, see http://www.speedoftrust.com/How-The-Speed-of-Trust-works/book. Continue Leading the Interstates way . . . by Extending Trust to others!